Aside from their looks, I think Sonic the Hedgehog and Faith from Mirror's Edge have a lot in common. Why, then, do I admire the latter far more than the former? I tried to answer that question this week on PopMatters. Part of it stems from design. I started thinking about this after reviewing Sonic CD: Poor Sonic always finds himself environments that aren't conducive to his success. Sonic's a race car that gets thrown into the middle of an obstacle course. Instant deaths and unforgiving platforming segments wouldn't be so irritating if they fed into the traits that make Sonic unique. Is it any surprise that a game built around speed starts to feel off when things slow down? Mirror's Edge suffers from similar problems, but at least Faith has a wider variety of abilities on which to fall back. It's exhilarating to sprint across the rooftops, but the game is as much about careful jumping and climbing as it is about racing. If you're willing to push through the difficulty, the non-running segments of Mirror's Edge will still reward you by showcasing carefully constructed facets of the game. 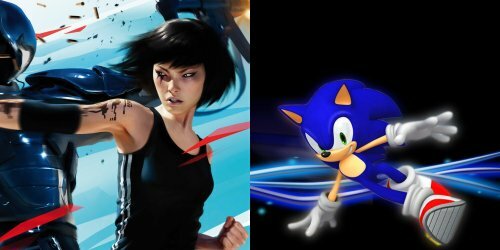 I also think my recent re-discovery regarding the importance of a game's presentation pushes me in Mirror's Edge's direction. It's an obvious thing to say, but Mirror's Edge is a novel game. First-person parkour games are in short supply, while cartoonish sidescrollers are a known entity (anyone remember Bubsy?). Mirror's Edge still has many of the same problems that plagued older games, but these problems are easier to excuse thanks to the fresh perspective. Of course there's also the nostalgia factor. I don't have the history that some do with the Soinic franchise and it's hard to go home to a place where you've never lived. One player's flaw is another's cherished quirk. All things being equal, if I have identical gripes about two games, I'll give the benefit of the doubt to one that's taking chances. Subjective as this all is, I had a good time conducting this little thought experiment. As always, there's no accounting for personal taste, even when it comes to my own. I'll side with Faith. Good stuff here, I dig it.